Product – How does the product relate to the consumer’s needs and wants? Price – Price is as much about perception as it is about dollars and cents. Placement – How does the customer buy the product? What’s the environment like where the product is sold? Promotion – What methods do we use to get the word out? This last P is often considered advertising and is probably the most obvious P. It’s the one that non-marketers think marketing is all about. A fundamental mix of ingredients, marketers worldwide break down the endless things they need to consider into these four categories. If they consider them all, they just might succeed. Or will they? Okay, so it’s a marketing buzzword (often heralded by social media advocates), but I think there’s still some meaning left in it. 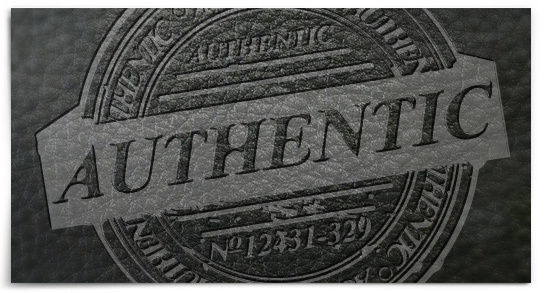 In the context of marketing, authenticity simply means clearly stating your values and acting accordingly. Broadcasting in the hands of everyone. This means that, increasingly, the marketing message is being told by employees, customers, and anyone with the remotest interest. Most don’t know a thing about good PR, but they love to share a good story. The best way for a business to stand out in this kind of marketplace is to show their true colours. They have to come out of the proverbial sweatshop and tell us who they really are. When they’re honest, and what they say aligns with how they act, we find authenticity. And we (consumers) love it. Why? Because it’s real. It can’t be faked. We can sniff out a phony faster than you can type “buy my product” on twitter. Purpose is always found in passion. Staying up late, working around the clock, and getting a business off the ground requires passion. It’s what kick-starts a new business and drives a non-profit organization. Over time, when the passion wanes and process and profitability take over, marketing suffers. Why? Because the human element is gone. The marketing is no longer authentic and it’s time to rediscover your purpose by remembering your passion. The latin root of the word “passion” harks back to the word “suffer.” And that makes sense. When we’re passionate about something, we’re willing to suffer for it. Passion isn’t just an intense love. It’s also pain. And the pain ingredient works on another level too. It’s also a painful process to articulate your passion. It requires soul searching which shatters platitudes about quality and service. It’s not easy, but it’s worth it. When we’re willing to suffer, we add a dimension of meaning and purpose. By rooting our marketing in that story, we’re being authentic. And that’s compelling. Aligning your marketing with a purpose that’s rooted in passion, for which you endure(d) pain, is just plain powerful. There’s no mistaking it. It’s real and human, and people gravitate towards brands that ooze their true character and personality. In doing so, they affirm the maxim that people want to buy from people, not businesses. That kind of power drives decisions in all directions and has a major impact on staff and customer alike. The original 4 P’s are great, but I suggest that without a purpose born of passion, without enduring the pain to articulate that message, your marketing will be power-less to inspire. Organizations that align product, placement, price and promo with purpose will succeed in making a meaningful, authentic connection with their audience. And they’ll do it by being genuine. Are you worried that transparency means you have to be perfect? I don’t think that’s a problem. As in everyday relationships, people can forgive and accept imperfection. We only ask each other to be real and true. Who’d a thunk it? Honesty and truth leading the way…As a marketer, that’s something I can be passionate about. Trademarks – Don’t go it alone!